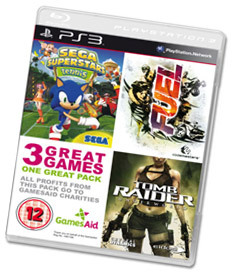 The special Triple Game Pack (release date 25th June 2010) is being sold to support the Games Aid scheme. It is a charity organisation predominantly supporting UK children's charities. The RRP for the pack is £39.99 but if you look around you can get it for £29.99 - which is both a bargain and a great way to show your support for the charities and the GamesAid scheme.